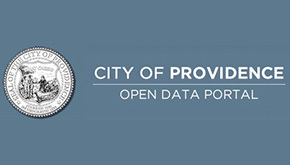 The City of Providence today launched the state’s first municipal Open Data Portal. The portal, a key recommendation of the 15-member Open Providence Commission enables the public to access and export municipal data sets. At launch, the Portal is populated with 25 data sets including: salaries and pension payrolls, the CIty budget, roads projects (including the Road Bond), vacant property, PEMA emergency information, union contracts, tree inventory, zoning maps, flood maps, and property assessments. The City plans to populate the Portal with more data sets over time. The Portal provides this data in searchable and exportable formats, allowing for mapping of data, creation of apps to read data, and merging of different data sets into tables and maps. The portal also allows users to embed data on their own webpages with that embedded data updating as the City adds to it. By creating a free account with Socrata on the Open Data Portal, users can save visualizations they’ve created and also compare Providence data to other cities’ data in the Socrata system. The system allows the City to upload historical data and future forecasts for comparison as well. The Portal was created after viewing similar programs in other cities including Boston, Chicago, and Baltimore. An RFP for the the portal was issued last November and awarded to Socrata. The Portal costs the City $30k per year to maintain. The City says they are working on incorporating data from the ProvConnex System into the Open Data Portal at this time. Another recommendation of the Open Providence Commission was a Meeting Management System for the City. An RFP has been issued for this system and bids are due next month. The Meeting Management System will create a hub for agendas and minutes for City Council, Boards and Commission, and other City meetings as well as minutes from those meetings. The City hopes to choose a winning bid in August and work on building this new system after that. The Open Data Portal is live on the City’s website now, check it out and let us know what data you find useful.